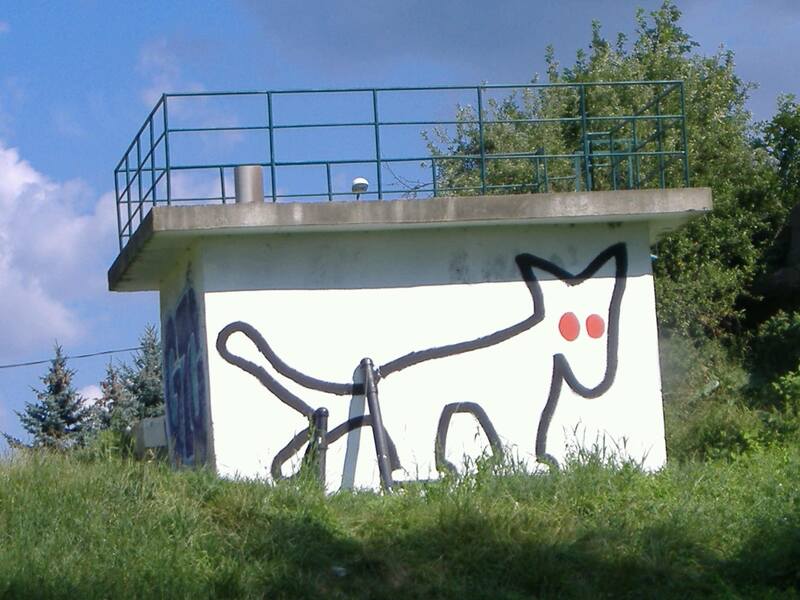 The Hungarian Two-Tailed Dog Party’s logo sprayed onto a wall. Image courtesy of Wikimedia Commons. The Hungarian Two-Tailed Dog Party has spreadheaded ironic political movements in response to Fidesz`s dominance. Amongst the various official opposition parties present on the Hungarian ballot list this past election is the Magyar Kétfarkú Kutya Párt, or the Hungarian Two-Tailed Dog Party. The party established in 2006 with an agenda laced with irony and whose members regularly dress up as various animals. Leader József Tichy-Rács dresses as a chicken and fellow member Veronika Juhász, as a gorilla. “I believe that every person has his or her own Gorilla inside of them,” explains Juhász as part of her reason for choosing the gorilla, of all animals, as her alter-ego. “Of course, as a party representative, I also felt obliged to show my real face, at least during the campaign. In the lead up to the Hungarian election, which came to a head on Sunday, April 8th, Juhász planned on displaying a video to the public showing what has been, as she describes, “a core activity of the Two-Tailed Dog Party, for about two years now.” It is an aspect of the group that provides a more serious feel of environmental activism: Gorilla Gardening. Juhász expressed her belief, that plants have the ability to inspire people to improve their lives, in spite of relatively low working wages. Aside from this, another prominent project that Juhász is involved in is a band that is affiliated with the Two-Tailed Dog Party, which uses music as a medium to promote their messages. The MKKP gorilla performs as the band’s lead singer, and one such message that the band has conveyed comes in the form of ‘Mosolygós Vasárnap’, or ‘Smiling Sunday’. The song is an inverted rendition of the distinguished Hungarian track, Gloomy Sunday, played in a major key. This, Juhász says, was used to declare her candidacy in the lead-up to the 2018 election. In response to those who believe that the party’s existence is taking possible votes away from other opposition parties, fellow candidate József Tichy-Rács stated in an interview with Euronews that he was “eager and willing” to do just that. Tichy-Rács referred to himself as “the most potent opponent” for other opposition parties. Tichy-Rács has also expressed belief that the people of Hungary have lost faith in human politicians. An MKKP campaign poster in central Budapest. Image courtesy of Aaron Hurst. It certainly isn’t all monkeying or horsing around, nor is it personification of any other animal for that matter. For an example of the MKKP’s sincerer side, the party took aim at Prime Minister Orbán’s seemingly anti-migrant rhetoric back in 2016. They encouraged voters to mark ballot papers for Hungary’s European Union migrant quota referendum with drawings of penises. This led to a low turnout of valid votes declaring a consensus that a quota for migrants allowed into Hungary should be refused null and void. Furthermore, the party satirically responded to anti-migrant billboards that depicted messages such as “Migrants perpetrated the Paris Attacks” with more ironic posters displaying the like of “There is a war in Syria”. Two years on, and the Two-Tailed Dog Party is most liked Hungarian political party Facebook page with approximately 14,000 likes more than the Fidesz party. With 1.71% of votes in the 2018 election, they seem to be marking their territory within the Hungarian political scene, albeit a small one. Aside from the MKKP, satire has been rife among protests organized by young people. In April 2017, amendments to the Higher Education act ordered universities accredited outside the country, a notable example being the Central European University, to abide by Hungarian regulations. Demonstrations in the centre of Budapest began like most others, orthodox, with straight-shot slogans. After these formalities, however, came a much less conventional series of events; flash mobs and references to social media such as Facebook’s ‘Angry’ reaction button being depicted on signs, the latter of which being a seemingly fitting reflection of the origins of these marches. It was believed that laughing at politicians could decrease the supremacy aspect of their aesthetic. Hungarian cartoonist Marabu, real name Róbert László Szabó, represents another prominent contribution to satire in Hungary. His cartoons ironically depict matters such as migration and the country’s relationship with the EU. His cartoons were a regular feature in the Nepszabadsag newspaper before it closed down in 2016. With the matter of education continuing to prove an unresolved issue in Hungary, further protests on the part of the student sector of the population can be expected to continue down the line.